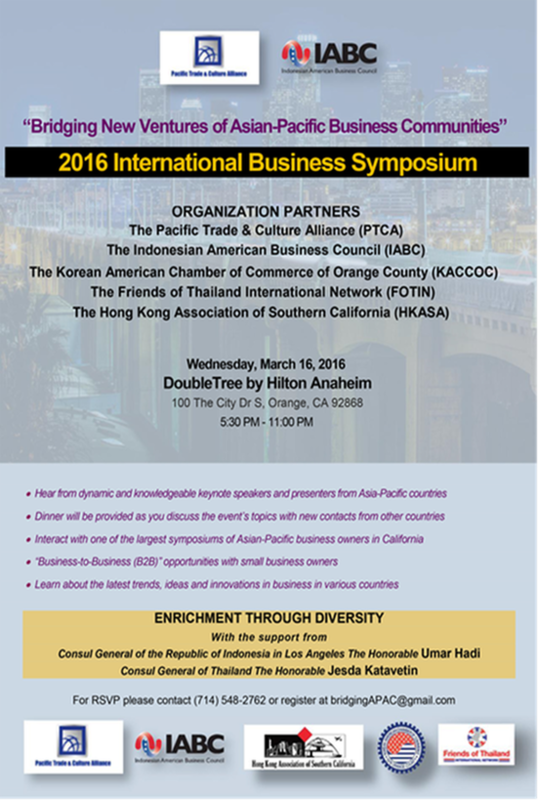 ​The Pacific Trade and Culture Alliance (PTCA), the Indonesian American Business Council (IABC), the Korean American Chamber of Commerce in Orange County (KACCOC), the Hong Kong Association of Southern California (HKASA) & the Friends of Thailand International Network (FTIN) – warmly invite you to attend our first International Business Symposium that will take place on Wednesday, March 16, 2016, at the Double Tree Hotel in Orange County, California. The theme for this upcoming event is, “Bridging New Ventures of Asian-Pacific Business Communities”, dedicated to bring together business professionals and owners, both domestic and abroad, with a shared vision to enhance trade opportunities, focusing on topics such as Investment, Tourism, International Trade, and the Import/Export industries. The Symposium will provide a forum for at approximately 250 professionals and owners from the business community to exchange information, network with other businesses, share best practices, and learn about the latest business opportunities from their respective Asian-Pacific countries as well as the United States. A diverse group of high profiled consulate representatives will already be in attendance, such as guests from the Republic of Indonesia, Hong Kong, Thailand, Korea, Philippines, and Cambodia.